Last week I had to go to Marseille for an exam. I had never been there before so I decided to stay a bit longer to visit the city. 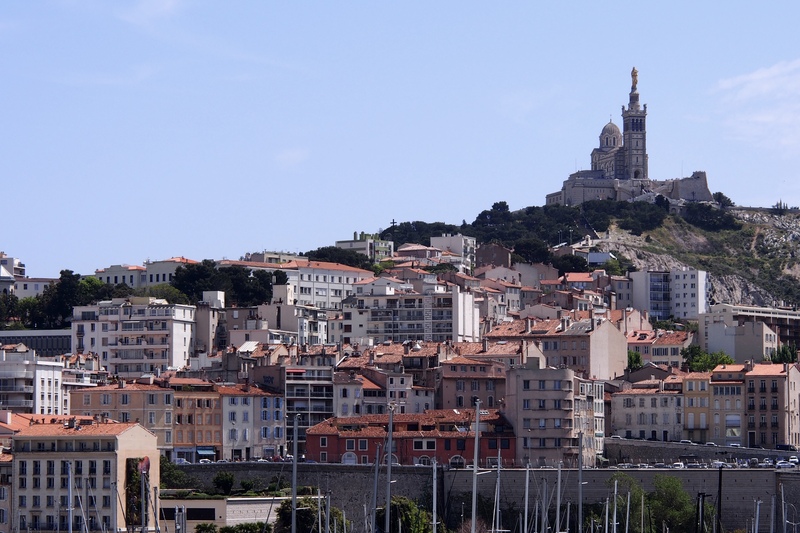 I only had one full day to visit Marseille and I thought it was going to be too short. However, because I was on my own, it turned out really well and I managed to do everything I wanted to. My Airbnb flat was very close ti the Old Port so I came every day. This area is ideal if you are only staying for a fer days because it is close to everything. The metro and tram are a 3 minutes walk away. The square at the end of La Canebière is very pretty. I took loads of pictures in the evenings because the light is incredible. There are lots of restaurants around the Old Port so definitely check them out of you have time. Friday morning, there were fishermen selling their fish by the water. The smell was great and made me want to buy everything (even though I can’t really cook…). Last year, during my Erasmus in Cardiff, I took a module on architecture and history. We studied the Cité Radieuse for quite a while so I was very excited to actually see it in real life. It is a huge building where everything is supposed to be: housing, shops, a hotel, a school… It is very easy to get in the building and even to go to the top of it. The view in incredible. To go there, I took the metro to « Rond Point du Prado » and then walked straight on until I found it. By doing that, you also walk past the Stade Velodrome which is Marseille’s very famous football and rugby stadium. Probably the most symbolic place of Marseille. Every picture of the city has Notre-Dame-de-la-Garde on it. It is really easy to get there. From the Old Port, you just have to take the bus 60 and it takes straight to the top. When I went, there wasn’t anyone so it was very nice to visit. Walking around and in it is very pleasant. Even if you mostly come for the view onto the city, the inside of the basilica in incredible too! I took the bus 60 again which takes you straight from Notre-Dame-de-la-Garde to the MuCEM (Museum of European and Mediterranean civilisations). I have always wanted to go there since it opened in 2013. The museum allows you to discover a different side of anthropology. I really enjoyed the permanent exhibition. There was also a temporary exhibition on rubbish that was very interesting but worrying. The architecture of the museum is insane! I am a big fan of the mix between steel, concrete and glass. Coming out of the MuCEM, I came across the cathedral. I had no idea it was so close to the museum. I couldn’t go inside but even from the outside it looks unlike any other churches I’ve seen. This place was mentioned in every article I read about Marseille and it is completely understandable. The city looks like any other French city. However, this area doesn’t. Suddenly, you feel like you’re in Barcelona or Rome. It has this typical mediterranean vibe to it and it’s lovely. If you are in Marseille, you have to go! I went to two different places: St Ferreol street and the Terrasses du Port shopping centre. Even though the shopping centre is further away, it is really good! There’s a great selection of shops, a nice outdoor area and it’s very easily accessible by tram or metro. St Ferreol street isn’t as nice. There are less people so it’s easier to shop but if you want to walk around in a nice atmosphere, it’s not as friendly. Metro/ tram/ bus ticket is 1,70€. It lasts for an hour. Be careful, it is 2€ if you buy it on the bus so try to get it from a ticket machine near the tram or the metro. On the day I visited everything, I bought a 24 hours ticket that costs 5,10€ which was completely worth it. That’s it for my post on Marseille. I really loved the city which is full of culture. I hope I will be able to come back soon and even perhaps visit the surroundings. If you have been to Marseille before or if you are going soon, I hope this article was useful to you and that you enjoyed it. I will see you very soon for another travel post!